MAPLE STORAGE Hand-crafted maple tops and finishes celebrate the natural beauty of the wood. Artisans enhance the look with a time-worn, heirloom aged effect. Choose from 16 beautiful finishes (9 wood tones, 2 weathered finishes, and 5 painted finishes). OAK STORAGE Custom made wood tables and buffets in varieties of white oak and red oak. The artistic grain, natural markings, and range of colors give the collection textural appeal. No less than 8 distinctive finishes in a range of colors offering design versatility for many lifestyles. Custom made, Bench*Made, handcrafted tables fuse uncommon craft and artistry in solid red leaf maple or solid oak. (The timber is harvested from sustainable forests in the Appalachian region of the US.) Every custom table, custom desk, and custom storage is uniquely extraordinary, with substantial 2” thick tops. Whatever the occasion, special dinnerware or table linens, electronics, family albums, even entertainment equipment, this remarkable handmade furniture in solid red leaf maple or solid oak is made to last a lifetime. Made one at a time. Just for you. Exactly the way you want it. Exceeding every expectation and excelling by every measure isn’t easy. Every piece of this furniture made in the USA is custom crafted from either solid red leaf maple or varieties of solid white or red oak. The timber is harvested from sustainable forests in the Appalachian region. And for every piece created, Bassett returns to the region and plants two trees. That’s about 60,000 trees and counting. This unyielding commitment to sustainability and to supporting the environment gives everyone a little peace of mind. Inspired by traditional design, constructed with pride and executed by hand, your custom storage and custom wood furniture from Bassett are designed for a lifetime of use. Bassett, an American original. You really can’t make it any better than this. With artistry, precision, and painstaking attention to detail, Bassett’s finest craftspeople create each Artisan Table by hand. 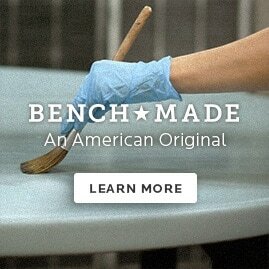 In fact, the entire Bench*Made line is made old school, in Bassett, Virginia where Bassett started making hand crafted benchmade tables and bench wood desks back in 1902.